I've been craving my Momma's taco dip. It has literally been years since I had it, but out of the blue I could taste it! That was Sunday. I bought the ingredients yesterday and made it last night. I hoped to dig in last night, too, but, by the time I got it and dinner done, it was too late. Beat together cream cheese and sour cream. Spread in a 9x13 pan. Spread mixture with taco sauce. 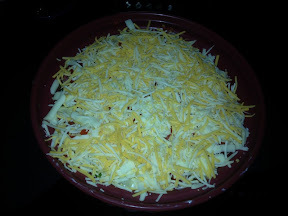 Top with remaining ingredients, ending with cheeses. Note: I made a half batch. Enjoy!